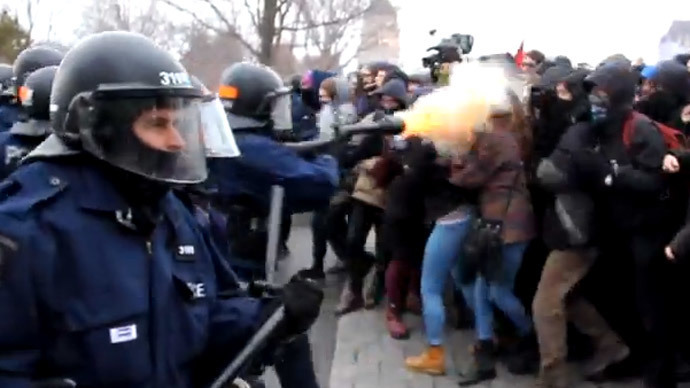 Students in Quebec City were sprayed with tear gas by Canadian police after holding an ‘illegal’ gathering to protest the provincial budget. A brief scuffle broke out before law enforcement officers began randomly gassing the demonstrators. Hundreds of students, some traveling from as far as Montreal, had gathered in front of the National Assembly to protest the Quebec government’s budget, which had been tabled on Thursday. The demonstrators wanted to hold a protest in front of the National Assembly to show their disgust at cuts to services such as healthcare on campus and library hours. They were met by a line of riot police in full body armor. There was a little pushing between the two sides and after a brief stand-off, the police began firing tear gas indiscriminately at the protesters from close range. One demonstrator, Mario Jean, told RT that protesters are now more powerful than ever. The police said that the Student association, the ASSE, did not give them an itinerary for the gathering in Quebec City, which violates a bylaw in the city that requires the organizers to do so in order for a demonstration to be considered legal. A spokesperson for the ASSE, Camille Godbout, said the current government has also made a number of cuts to the education sector, since they came to power in 2013. “In the Cegep for example in Drummondville, the library hours were cut in half. Also services like psychology and having access to health services on campus. These are all the services that are being cut right now and this is just going to get worse in the next few years,” Godbout said, according to CBC.